Bethesda, MD – With anticipation and excitement, Cedar Lane UUC, located on Cedar Lane, officially kicked off its “Building Our Vision” Capital Campaign at the Women’s Club of Chevy Chase, the site of their first church service 67 years ago. Over two hundred and sixty members and friends enjoyed an uplifting afternoon with great food, music, speakers and fun activities for all ages. In 1951, Reverend Dr. A. Powell Davies knew the time was right to plant new congregations around the DC area. Cedar Lane was one of the five Unitarian Churches founded during the last five years of Davies’ ministry. While plans were moving forward to build a church, members met at the WCCC and gathered around a telephone and amplifier to hear Rev. Davies’ sermons. Due to Davies’ vision, Cedar Lane has become a driving force for social justice in the area and around the world. “Just as the founders who met in this location in 1951 took a great risk, we owe it to future generations to revitalize our facilities to meet Cedar Lane’s growing mission,” said Don Bliss, Campaign Co-Chair. The afternoon closed on a very high note with the children making the big reveal and Reverend Abhi Janamanchi’s inspiring words. 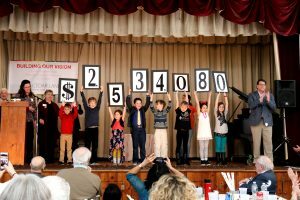 With only 10% of member families participating before the official combined Annual/Capital Campaign launch, the children revealed $309,160 in pledges toward the 2018-19 Annual Campaign and $2,534,080 pledged towards the long-term vision of Cedar Lane. This is 3x’s what Cedar Lane raised in their last campaign twenty years ago and this is just the beginning of the campaign. “The whole day was amazing. The energy that filled the Women’s Club and the official Kick-Off celebration was incredible. Many shared that Cedar Lane had not had an event like this in years and it was just perfect,” said Mel Kalagian, Campaign Director for James D. Klote & Associates. Rev. Janamanchi’s words, which closed out the afternoon, inspired and excited everyone. “We are accountable not only to ourselves and our values, not only to the rich legacy of this congregation and this faith but also to the future. What we dream and the ministry we do together will be the legacy that we leave,” said Rev. Abhi Janamanchi. With offices in Falls Church, Virginia; Chicago, Illinois; Los Angeles, California; Dallas, Texas; and Toronto, Ontario, James D. Klote & Associates is the largest full-time, on-site stewardship consulting firm in North America. For additional information, please contact the firm at www.jdklote.com or (800) 360-2315.